Did you know that effective time management is a key principle to a less stressful life? If yes, then why do so many of us struggle with managing our time better? Just in the last week alone I’ve noticed a number of people on Twitter saying “I need more hours in a day”. No matter what our situation is there never seems to be enough time to accomplish all the things we would like to get done. Whether it is stuff for work, chores around the house or simply finding time to hang out with friends and family – we all seem to be running around, frantically trying to keep up. If you are one of the many people that wishes there were more hours in each day, here are some tips on how to accomplish more in 24 hours and still enjoy your life. Do you eat breakfast? Eating a good breakfast that includes a good source of protein will definitely make your day easier. Why? Because protein boosts our energy levels and our outlook on life in general. You will find that on the days that you eat a good breakfast that is high in protein, tasks that typically annoy you, upset you, or slow you down, will no longer bother you. You will smile and you will find yourself accomplishing all kinds of things. If you are typically in a hurry to get out of the door in the morning, one thing you can do is to bake a large quiche of eggs, veggies and cheese when you have a minute (it is quick and easy). When it cools off after it is finished baking, slice it into serving size pieces and place it in a storage (freezer type) container. Freeze some portions and put the rest in the fridge. Each morning you can quickly heat up a serving of the quiche in the micowave in about 3 minutes, and there you have it, a good protein based breakfast. At the beginning of every week write out a daily to do list. Include work stuff, household chores, appointments, kids activities, grocery shopping, meal prep, fun time, and so on. Go through your list and prioritize each task. Some things absolutely have to get done, but there may be a few things that you can reschedule for another time. As well, many of us have certain times of the day where we feel more alert and more motivated then other times. As you prioritize your tasks do your best to take advantage of certain times of the day. For example, if you feel more motivated to exercise early in the morning, then do it. If you feel more motivated to do some baking and make some extra meals after your children go to bed at night, then do it. Pay attention to what your body is telling you instead of working against it. If the majority of your time is spent managing your household then the best place to keep your calendar is somewhere in the kitchen so that all family members will see it, and hopefully everyone will be on the same page, so to speak. Likewise, if the majority of your time is spent managing your business, or your job, and it’s just you, or just you and your spouse, then perhaps an online calendar or a paper based daily planner would work best. How many times have you looked at the clock and it’s noon and you realize that while you did a lot of little things throughout the morning, you haven’t completed any of the major tasks that you had schedule for that morning? We all do this, especially if we dread the tasks on our schedule. If you do those dreaded tasks first thing, by noon hour you will feel amazing. You will be able to strike those tasks off of your to-do list and you will feel this sense of accomplishment that will get you through the rest of your day. So tomorrow morning instead of doing a lot of nothing, choose to do at least one important task right away. As you do this each day it will soon become second nature to you. 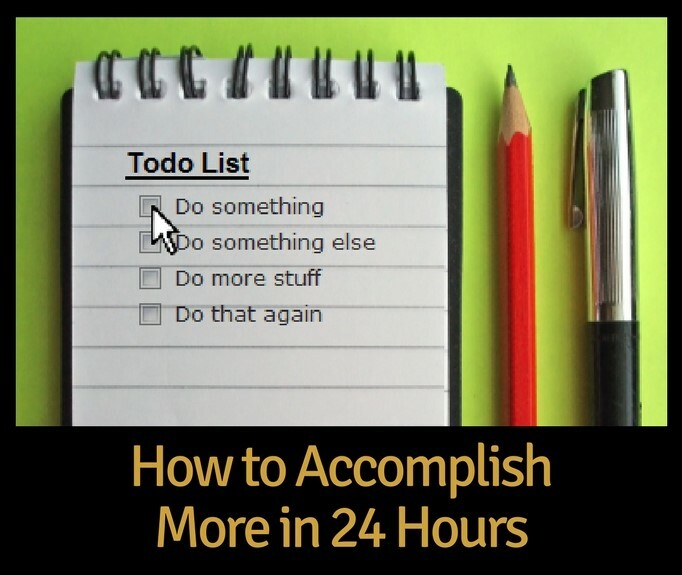 How do you accomplish more in 24 hours? You delegate, whenever and wherever possible. If you operate your own business or have a job that allows you to delegate tasks, then do it. Quit being afraid and quite assuming that others will not do it as good as you can do it. If you live on your own or your house consists of you and your dog or cat, then delegating home chores may be more difficult. As much as I would like to, I know our cats cannot clean their own litter boxes. But if your house is over flowing with family members and you are solely responsible for running the house, it is time to start delegating. Use your calendar to list all of the chores that need to be done and who should be doing them. Your list could include setting the table, cleaning out the dishwasher, vacuuming, or mopping the floors. The more responsibility you pass to everyone else in the house, the more you will accomplish each day. Perhaps you need to tackle a big project at work or you need to tackle a big project at home, such as landscaping your backyard or painting the fence. Break this large task into smaller more manageable tasks, and include those tasks in your daily schedule. Hang a do not disturb sign on your door. Turn off the TV, your cell phone, your home phone, your office phone, and focus on the task at hand. If you need to get a paper written, just do it. If you need to complete a project for school, or work, allow yourself several hours of uninterrupted time, and just do it. Life is meant to be enjoyed, and if you fill your calendar with one task after another you will be completely wiped out. Remember to allow yourself a little bit of me time everyday to re-energize. Whether you go for a walk, or simply sit with your feet up and enjoy a coffee, whatever helps you to relax. As well, make sure to allow yourself some time at least one day or one half day a week where you have nothing scheduled at all. Have you ever noticed that there are those that talk and talk about all the things they are going to do, but never do them, and then there are those people that just get up and get going, and manage to get more done by lunch then the rest of us do all day long? If you are a busy person that always wishes for more time, take a closer look at how you currently spend your time. Are you a talker or a doer? There are so many things that we can all do to get more done in 24 hours. The first step is to look at how you currently do things and how well that is working. The second is to implement a new schedule or make adjustments to your existing schedule. And by all means, remember to delegate whenever possible. NextCan Money Buy You Happiness?